NEWPORT, R.I., Sept. 14, 2017 — Hinckley, the builder of America’s finest yachts for nearly 90 years, continued its legacy of innovation today by unveiling the world’s first fully electric luxury yacht – Dasher. Designed from the outset for fully electric propulsion, Dasher achieves a new standard of excellence pairing modern styling with hi-tech composite construction. 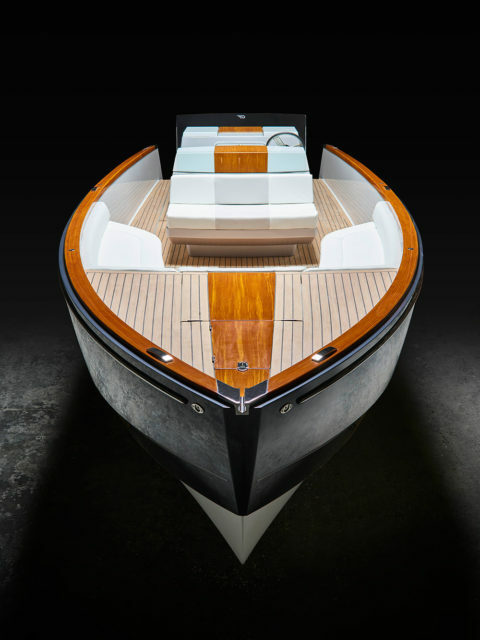 “Since 1928, Hinckley has pioneered beautiful, timeless, and highly innovative yachts. We have a long tradition of innovation in pursuit of the perfect yachting experience. 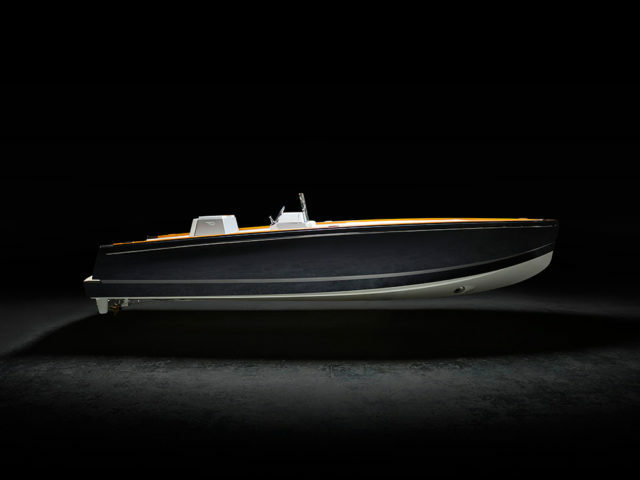 From the early use of fiberglass in the Bermuda 40 in the 1960’s to the adoption of jet drives on the category-defining Picnic Boat, we’ve always worked to combine the latest technology with cutting edge naval architecture to do what has not yet been done,” said Peter O’Connell, President and CEO of The Hinckley Company. Dasher, borrowing her name from the game-changing, original Picnic Boat hull #1, sports a carbon-epoxy composite hull shape designed by Michael Peters to provide superior performance and handling. With hand-painted, lightweight composite Artisanal Teak, every ounce of weight has been shaved and sculpted. Titanium hardware and console details were both 3D printed to achieve shapes and a level of precision unavailable in typical construction methods. Dasher powers her 28 feet 6 inches with twin 80hp electric motors and dual BMW i3 lithium ion batteries. 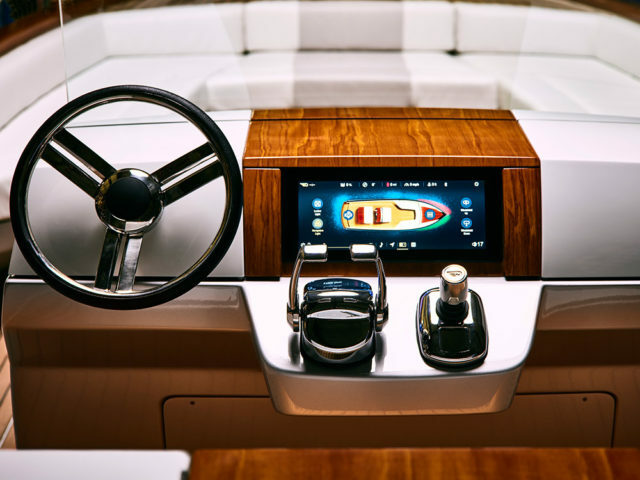 “The Hinckley Whisper Drive silent propulsion system combines the latest hydrodynamics, electric power and digital control systems to achieve the performance handling and maneuverability that discerning clients will expect,” said O’Connell. Quiet propulsion, zero emissions and zero time lost at the fueling dock make Dasher the best way to spend time on the water with family and friends. Dasher accepts dual 50 amp charging cables, standard on most docks, so it can charge twice as fast as the most popular plug-in electric cars. Dasher gains a full charge in under 4 hours with dual 50amp charging. Her cruising speed is 10mph with fast cruising at 18-27 mph. Range is 40 miles at cruising speed and 20-25 miles at fast cruising speeds. 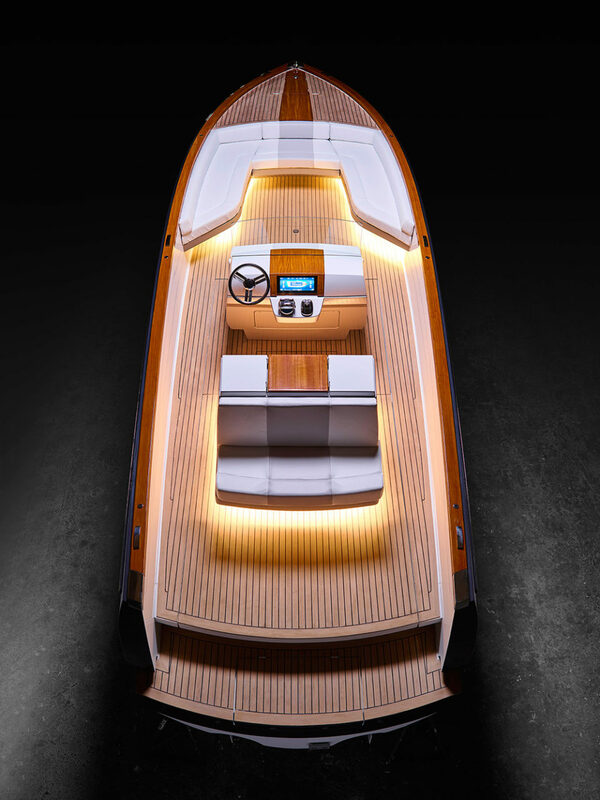 Twin 80hp Electric Motors – A silent driving experience with zero emissions is at the heart of the world’s first fully electric luxury yacht. Dual 50 Amp Dock Charging– Say goodbye to the tank – and all that comes with it. Dasher is equipped with standard on-board chargers that accept dual 50 amp charging cables gaining a full charge in 4 hours. BMW i3 Waterproof Lithium Ion Batteries – Dual BMW i3 lithium ion batteries have been designed with a prismatic cell design for efficient cooling and temperature distribution with compact size and superior shock resistance. Super-Light Composite Construction – Dasher is the lightest Hinckley ever. With a carbon-epoxy composite hull and carbon stringers, Dasher is light and sleek, bringing together performance and propulsion like never before. Open Layout – Dasher’s open layout allows for numerous possible configurations. Social Console – Dasher’s console is designed to allow the Captain to join the party. A retractable windshield makes it easy to connect with guests, even while at the helm. And touch-screen control makes navigating equally simple. 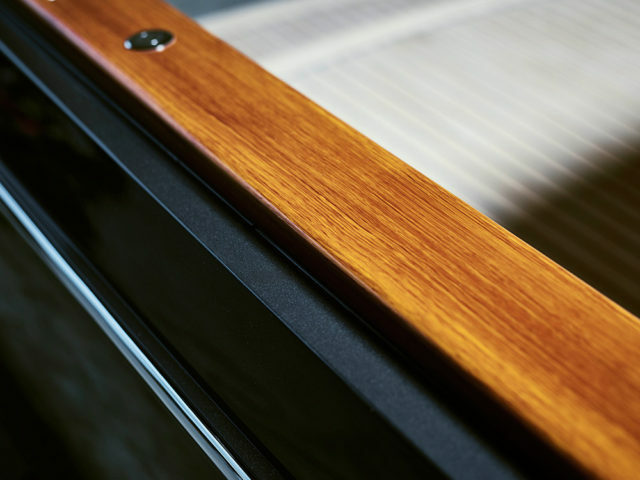 Artisanal Teak – Dasher also marks Hinckley’s debut of Artisanal Teak, a lightweight hand-painted epoxy composite that has Hinckley’s signature varnished teak look without the weight or maintenance costs of traditional varnished teak wood. 3D Printing and Additive Manufacturing – Dasher is constructed with 3D Printing and Additive Manufacturing for precision construction. An innovative way to create intricate shapes with fewer parts, Additive Manufacturing is changing the way yachts are built. Shallow Draft – As on all Hinckley Yachts, Dasher has a shallow draft that allows boaters to explore places they simply couldn’t access on other yachts. The world’s first fully electric luxury yacht is here. Reservations are now being accepted for delivery in Summer 2018. To inquire, please click here.